Like other reptiles, your gecko will shed his skin on a regular basis. Unlike many other reptiles' shed skin, however, the dead skin comes off the gecko in strips and pieces rather than as one large section. Monitor your gecko closely during this time to make sure that no pieces of old skin are left, especially on the toes where it can restrict blood flow. It is normal for a gecko to stop eating entirely or eat very little when he is shedding. Most geckos eat only once every two to four days, so it may take some time to realize that he has stopped eating. For his health, remove any leftover food from the enclosure when he is shedding. Live food, such as crickets, may irritate his sensitive skin; while dead food is a breeding ground for bacteria. Resume your gecko's normal feeding schedule as soon as he is done shedding. A gecko's shedding cycle is tied to growth rather than to a schedule or season. This means that young geckos who are growing rapidly will shed much more frequently than adults. 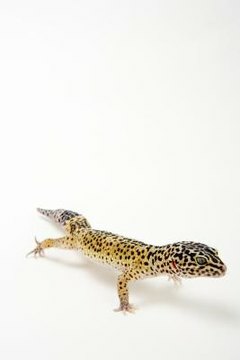 You can tell that your gecko is about to shed, because his skin will get dull and the colors will be muted. Just prior to shedding, he may appear to have a white veil or coating over his skin. Since this is a stressful time for your gecko, give him a dark, quiet place to shed where he feels safe and secure. It may be necessary to put a screen or barrier in front of his enclosure if it is located in a busy room. He also needs plenty of moisture to keep the dead, shedding skin from drying too quickly and adhering to his body. Increase the humidity in his enclosure or give him a "moist box, a container with wet paper towels inside, where he can spend time while shedding. A few other circumstances could cause a captive gecko to stop eating. If he is stressed due to a change in habitat or the addition of other geckos, for example, he may not eat for a few days. If the temperature of his enclosure is too low, his body function may slow down and his appetite will drop. Use a high-quality thermometer to monitor the temperature, and increase the amount of heat as needed. Internal parasites can cause a gecko to lose his appetite. Check with your veterinarian if you suspect parasites. How Come My Lizard Won't Eat? Should Male & Female Geckos Be Housed Together?